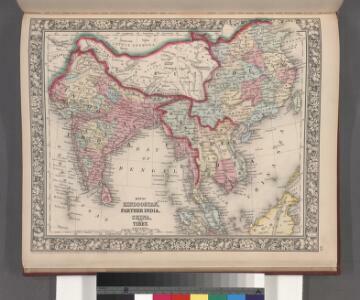 Map of Hindoostan, Farther India, China, and Tibet. 104. Asia (Outside the USSR) Communications. The World Atlas. 1 : 30000000 USSR (Union of Soviet Socialist Republics). 1 : 15000000 Asie jihovýchodní Visscher, Nicolaes Jansz. 1 : 18500000 Stulpnagel, F.v. Description: from Mitchell's new general atlas, containing maps of the various countries of the world, plans of cities, etc., embraced in fifty-three quarto maps., forming a series of eighty four maps and plans, together with valuable statistical tables.